Members of the nine athletic programs at Herkimer College participating in Gram Lorraine, along with Head Coaches Pepe Aragon, Ryan Brooks-Newton and P.J. Anadio, and Athletic Director Donald Dutcher and Ray Lenarcic. 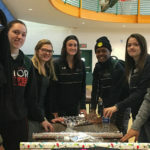 Nine Herkimer County Community College athletic teams are helping local families this holiday season by donating money and gifts for children who are in need. Hundreds of sponsors, including Herkimer College, are supporting the Herkimer County Hunger Coalition Gram Lorraine Children’s Christmas Program, an initiative started by Herkimer College Professor Emeritus Ray Lenarcic and his students. Identified by select nurses and teachers, hundreds of children in the community will receive four items of clothing, a toy and book or game. The nine athletic teams that helped to support the cause this year are men’s soccer, men’s basketball, women’s soccer, women’s basketball, swimming & diving, cross country, women’s lacrosse, women’s volleyball, and softball. Their goal was to help this project bring happiness to those less fortunate, something the Generals have participated in now for the past nine years. 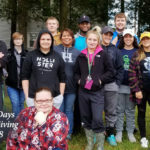 In addition to the gifts purchased, 300 winter jackets will also be distributed in connection with the Gram Lorraine cause, with at least 100 of them going to a local school in Little Falls, NY – Benton Hall Academy. If interested in helping this cause, please contact Ray Lenarcic by phone at 315-866-7765 or by e-mail.